Bilateral Wrist Tendonitis - 3 and a half years! I am a 23 Yr old grad student with 3 and a half years of Bilateral Tendonitis in my wrists. Background story: It all started at the end of my 1st year of University. I was weight training and doing Thai boxing. Whilst doing reverse curls one day I felt a sharp pain in my left wrist on the 'pinky side'. I kept training and doing thai boxing and the pain worsened. I went to see a physiotherapist and was told I injured my 'Ulnar nerve' and was given wrist splints and was told to not train for a while. I stopped training but was working in a department store (Harrods) lifting heavy bags during my summer off. The pain then traveled to my forearms and I was then diagnosed with golfers and tennis elbow (Medial and Lateral Epicondylitis). I stopped using my left arm to lift bags and started using my right arm... and ended up overcompensating on my right arm causing the same condition in my wrist and my forearm. After finishing my job I then started 2nd year of university and was typing and writing a lot as I had many assignments and notes to write up. This caused the condition in my wrist and forearms to get worse and the end of my 2nd year I couldn't write for more than 5 minutes without getting pain in my wrist and my forearms. The condition continued to get worse in my 3rd year. I was also given extra time during my exams due to my condition. I would like to add that by the end of my 3rd year I had noticed that my elbows seemed to protrude more distinctively and every time I would put my elbows on the desk I would get pain starting from my forearm to my wrist (which happens even to this day). After graduating in 2009 I took off 1 year for my wrists and forearms to repair, as by this point they were very painful. I could not type for more than 3 minutes without pain in my wrist and my forearm (tennis elbow side), I also could not lift any sort of weight and found movement in my wrist painful if I was holding something. I also found that my wrists would feel stiff and click a lot, which was not present before I had the injury. From July 2009-February 2010 my wrists were very painful. However by March 2010 I pushed myself to exercise more and do the physio exercises which seemed to help. I started to lift heavier weights however I could not do bicep curls or tricep extensions as they would aggravate my forearms and wrist. What did help a lot was swimming, however I had to drive to the gym which would not help the condition! I went to Vancouver from July 2010 to the middle of August and on my last week I saw a physio who treated me very well, giving me a treatment of heat, massage/manipulation, ultrasound and stretching. This treatment made my wrists weak but pain free. (I have received this treatment before of manipulation or ultrasound which would help but it wasn't as effective as this recent treatment). It felt like the treatment released muscles that were not working well but it pushed me back to doing physio exercises from the beginning. When I returned to England my wrists got worse after using the computer. Now it is back to its painful stage where I cannot lift any weights and the physio exercises I do make them hurt more. tests. the blood tests at first showed an elevated amount of uric acid and a low Vit D count, however all of that is normal now since my last blood test. The MRI and ultrasound show that one of my bones in my wrists are a tiny bit longer than the other, and also there a small gap in my wrist (I have copies of these if you would like to see them). However it not conclusive if this happened after or before the injury. The surgeon also looked to see if there was any cartilage tear but there wasn't so I was discharged. - osteopathy - manipulation of the wrists and forearm, and also other treatments to my back and shoulder - this treatment I found effective in my 2nd year however after treatment I would go back to typing and writing notes which would not help. - Chiropractor - involving clicking of the back and wrist. I cannot drive, type for long periods, lift weights and even hold up the phone to my ear. I used to play video games but that also used to aggravate it so i had to sell my XBOX :(! I would like to add that I also have Bilateral rotator cuff injury which I got 3 years before I got my wrist injuries. I was receiving treatment for this injury but had to stop due to my wrist injury. I have found that when my shoulder hurts, my forearms hurt as well. The shoulder injury may have contributed to the wrist injury but I do not know. I was given Diclofenac Sodium by my doctor when I first received the injury.... this did not help one bit. Since then I have been taking Vit D tablets, Cod liver oil mixed with Glucosamine and omega 3 tablets, herbal medicine and pineapple enzyme, Bromelain, which I read about. It has been over a year since I have taken off to repair my wrists and the condition has still not improved. My golfers elbow has subsided and will only rarely appear if it is very bad. I have been unemployed during this period as I cannot type or lift anything. However I have now got myself a job as it is too stressful doing nothing!! I've also found that when I hurt myself I cannot get better as quick as I used to. e.g. I sprained my ankle 6 months ago whilst playing football (soccer!!!) and usually it would have healed by now, however it's still injured. Also I used to rarely get ill, however I have been getting ill nearly twice a year now. I would really appreciate it if you could provide any thought on what is wrong, how to deal with it and any other notes. 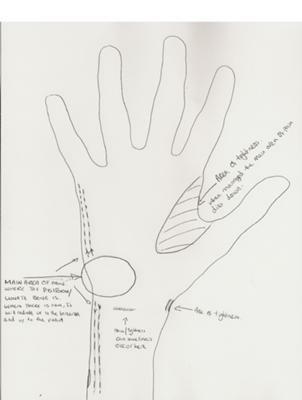 I have also sent you a sketch of the area which has been affected in the wrist. I have not sent you a forearm sketch as you know what golfers and tennis elbow is!! Comments for Bilateral Wrist Tendonitis - 3 and a half years! PART 2 - Bilateral Wrist Tendonitis - 3 and a half years! Wow, that's sounds like quite a trial by fire. Let's see what we can do. 1. Make sure your Vitamin D is up between 50-80. 2. Are you taking Vitamin D2 or D3? If you were taking prescription then it's highly likely that it was D2. D2 brings the numbers up but doesn't provide much of the benefits that D3 does. Thus it's a higher level on D2 is a bit worthless. 3. Magnesium for Tendonitis FOCUS ON THIS!!!! MOST IMPORTANT!!!!! 4. Yes, absolutely the shoulder is an issue. It's possible that the pain in your lower arm is from problem up at the shoulder. 5. Also, make sure to take the Bromelain on an empty stomach, otherwise it just digests your food. Q2. Describe the pain in lower arm. tight, sharp, dull, aching, throbbing, burning, etc? Q3. What's your overall diet look like? Belated reply! - Bilateral Wrist Tendonitis - 3 and a half years! Sorry for the major late reply, I've been really busy and also I can only type a few sentences per session before my wrists start hurting.
? I am taking vitamin D3, however I have now switched to the tablet form as I was taking a chewable form before.
? After reading your post I have now started taking magnesium tablets. It's been a 3 weeks since I have started and I have been taking it twice a day with the vitamin D3. I haven't noticed any difference yet..
? I haven't been taking the Bromelain much as I tend to get hungry quickly and I only get one lunch break at work!!
? The shoulder issue started 6 years ago, I was doing chest exercises and I forgot to release the weights on the chest machine. I felt a sharp pain but I carried on training and over time my shoulders protruded forward. The pain occurs usually at the front of my shoulder around the area where the Pectoral muscle connects to the shoulder. The pain also occurs around the top of the shoulder also but not as often as the front. I also find that when the shoulder is hurting then the neck tends to hurt as well. The pain I usual feel in my shoulder is a sharp pain which tends to restrict my movement. If I tend to have worked out my upper back then my shoulders tend to feel ok.
? My sister has the same issue but it is more severe, She has an impingement and calcification in her shoulder joint. I have been told it is rotator cuff injury/ impingement also.
? In the wrist area The pain is usually a sharp pain. Once the pain comes in both the areas then they tend to last the whole day.
? Also the other day i hit my tennis elbow side on the corner of the wall by accident and i had a massive amount of pain from the forearm to the hand. I could not move my arm for a couple of minutes, and after that my wrist and forearm were in pain the whole day. 1. How much Vit D? 3. Can you touch a spot on your shoulder that is super painful? Probably on or close to one of the shoulder cuff tendons. 4. You sister has the same thing? That's interesting. 5. Shoulder problem can definitely lead to wrist problems. 6. More protein! More good fats! Vegetarian diet, depending on how (well) you do it can easily lead to nutritional deficiencies, which can lead to Tendonitis issues. 7. Most shoulder impingement is due to TOO TIGHT structures in the armpit area. Stretch and massage. Reply!!! :S -- Bilateral Wrist Tendonitis - 3 and a half years! sorry for the late reply, I didn't know you replied to my message as i didn't get an email. I just randomly found out you did by chance! 4) I eat meat, fish and all the right proteins and fats. the treatment worked for a while but now the pain has come back. I am now going to be receiving a procedure in December called a Wrist Atheroscopy. this is where they put a telescope in my wrist to find the problem. if they can fix it then they will on the day. 100 prolotherapy injections? Really? Yikes. So I'll assume that you haven't gotten any of my products, like the Reversing Wrist Tendonitis ebook. Vitamin D3. Not enough. That's not even a maintenance dose. Magnesium. Not enough. Do at least 1,000mg (over the course of a day for a month and see what that does. Massage the front of the shoulder and the forearm muscles, repeatedly throughout the day, every day. Yeah. 100 per wrist & forearm over a 2 month period. I have not purchased any of your products yet. I'm upping my D3 dosage and possibly magnesium doseage from today. magnesium I'm a bit weary about as you can get sick from too much. I've been trying to massage those areas, but its pretty hard as both wrists are bad! Will see how the surgery goes in December... hope it works! Wow. 100. Per arm. Wow. What do you mean 'you can get sick from too much' magnesium? Do you mean stomach discomfort? In that case, yes, you can. But the solution is to take it throughout the day instead of a lot at once. No big deal. Question: If the prolotherapy didn't work, what is surgery going to do that will help? Reply - Bilateral Wrist Tendonitis - 3 and a half years! Actually i realised i calculated it wrong. it was over 100 injections all together though. Still quite alot! Dont know if anyone is even on this anymore, but I have been having extremely similar issues in my wrists going on 4 years now. I live in canada, and it took 3 yrs for my Doctor to get his head out of his you know what to get me proper testing. After 3 specialists, xrays, emg, etc... they finally got me an mri that showed torn ligaments in left wrist. My right wrist has same pain, but is 'normal', making me think that a new tear may be eminent. After 6 months have another specialist app in Jan 2017, yet to go to to discuss surgery options. Will write more if there is a response. I'd be curious to see what an MRI shows on the right hand. Have you ever taken any Fluoroquinolone antibiotics like Cipro, Levaquin, Avelox, Floxin, anything ending in 'floxacin'? Do you do anything hand-intensive, activity-wise? Did you have an accident or impact on the hands that would account for the tears? L - linear full-thickness tear in radial portion of triangular fibrocartilage. An incomplete horizontal tear in dorsal aspect of tri. fibr, extending to ulnar portion of the TFCC. Scapholunate ligament & lunotri. ligament normal. Flexor & extensor tendons are normal. no sign of tendinitis or tenosynovitis. Carpals normal. R - small cyst or ganglion found, but apparently accounts for nothing. ... Have you ever taken any Fluoroquinolone antibiotics like Cipro, Levaquin, Avelox, Floxin, anything ending in 'floxacin'? I started taking Holy Basil based Bell Product in year 2, as I couldn't brush my teeth without using my other arm as support. It saved me from quitting my job. Since then taken different things with varying results, but its all out of pocket as medical covers 0 here in Canada. Best results were Pharma Curcumin (Natural Factors), which I use now, and egg-shell membrane. Am presently doing accupunture, which has helped briefly, but not a sustainable thing, as it is pricey and temporary relief at best. ... Do you do anything hand-intensive, activity-wise? Did you have an accident or impact on the hands that would account for the tears? >>Last 5 yrs was a deficiency carpenter using my hands in a repetitive way 40 hrs a week, plus domestic duties once home..(scrubbing, yardwork, computer, etc).No major impact to hands, but lots of use. I tend to overgrip everything I use. Ironically my R often felt worse than L.
Another interesting thing> I twisted my ankle coming off ladder 2 yrs ago, but didnt see my doctor till recently, as it has not healed properly. I was limping for a week or so, but seeing my doctor has proven hit or miss..., my ankle has similar pain symptoms as my wrists. Acupuncture and my doctor seem to suggest that its inflammation of the tendons. Was icing my wrists 4-5x a day and eating anti-inflammatories like candy until I quit my job 6 weeks ago. Doctor wanted to up the meds as usual, but tried it with limited improvement so went back to Curcumin, which is just as effective and not hard on my stomach and liver. Wear splints everyday still, especially at night, but know they will only help prevent uncomfortable movement while sleeping. Looking for different line of work, but concerned about future, as every job needs you to use your hands. 1. You definitely have tendonitis dynamic: too tight muscle and connective tissue, inflammation, and nutritiona insufficiecy. Curcumin helped because it decreased the inflammation and thus the pain. 2. If you have a tear, that's obviously problematic. But you got the tear because of the tendonitis dynamic...muscles weren't absorbing force like they're supposed to, and that force had to go somewhere. You will heal better/faster and function better if you reverse the tendonitis dynamic: relax/lengthen muscle and connective tissue, dial down inflammation process, and replete the nutrition you are short on. The tear is obviously bad, but if can drop pain levels and restore proper function, you'll be way ahead of the game. 3. Nutrition is a BIG deal. When your body doesn't have what it needs, it can't work correctly on any level. Acupuncture can't fix a symptom of nutritional insuffiiency/deficiency. What is your vitamin D level? Did doctors test for that? 4. Nutrition/lack thereof affects the entire body, so helps account for the legs not healing etc. 5. It's ok to wear Wrist Splints to get you through the day/night. 6. I highly recommend that you get started with Reversing Wrist Tendonitis program. First and primary focus is nutrition so your body can work better and respond to the self care better, extra so you can heal the tears better/faster. Ice dipping as well to reduce pain levels. Not a fix per se, but drops pain levels and does other good things. The Specific Massage etc as directed. The only way to fix it (such that you can get back to working etc with your hands is to get to work on it, using the right tools. You've already tried tools that don't work. Hi, i injured both my wrists over a year ago by doing a bicep curl with my hand to close together pressuring the wrists and still have not recovered. They got better enough after long periods of rest till i feel ready do exercise again then they go back to square one after boxing or weight lifting. I am starting to think there is no hope with this injury as i have gone through extensive physio and rest for it just to return again. Is my problem fixable to regain high levels of activity ? I don't see why your wrist problem isn't fixable, if you do any of the right things that will actually help it. Rest will never fix a tendonitis issue, so don't be disheartened that you rested and the pain came back when you went back to activity. That's just how it works. That 'extensive physio' didn't help either, well, that's far too often how that works out. Again, no reason to become hopeless...they just weren't doing the right things to fix the lack of function you've developed. I'm a big fan of spending time/effort on doing the right things. Thus, I suggest you get and start working with the Reversing Wrist Tendonitis program (see link in this thread). I actually forgot I posted this back in 2010, it's crazy how time flies. It's interesting to read everyones comments on this thread and I don't mean this to seem negative, but I'm happy that I'm not the only one that had these types of problems and there are other people out there suffering from similar issues. Firstly before I start, I found out I have hypermobility. Many people have this and for some people it isn't a problem however for others it can cause problems like wrist injuries and other injuries. It is a genetic issue which can cause your ligaments and tendons to be weak, and there are many types of hypermobility such as Ehlers-Danlos Syndrome and Marfans Syndrome. You should go to check this out with your doctor as it can cause issues with your heart and many other important organs in your body. Due to the Hypermobility, I tend to get injured very easily and once I'm injured, it's pretty rare for me to get to 100% again. I currently have an injured ankle, MCL in my knee, shoulder and my wrists! My issues did not get better and actually got worse, so I ended up going to wrist ligament reconstruction surgery in 2013. My surgeon found a tear in my ligament and mentioned that the ligament was weak when he did some tests on me. He didn't know if it was weak due to the injury but I decided to undergo surgery due to the pain I was going through. I underwent 6 surgeries in total for both my wrists over a one year period. They reconstructed the ligament and put a temporary plate in my thumb to hold it in place. They then removed the plate 3 months later. Result - The surgeries worked... to an extent. My wrists did get better over time with my right wrist getting stronger and with less pain. The best part was my forearms. I had golfers and tennis elbow and that used to cause my excruciating pain but I hardly get it any more unless I type a lot (such as now) and even then, the pain is very minimal. However, over time my wrist hasn't recovered to 100%. Since moving to Canada in I re-injured my left wrist and for the last 1.5 years it's been very weak and pretty painful. However it's not as bad as before. My right wrist is still pretty strong but doesn't do great with weights above 15lbs if bicep curling. Both hurt the moment I start typing which isn't the greatest thing, however changes in my ergonomics do make it easier. I am now considering 1 of 3 options. 1 - Looking for alternative therapies such as Stem Cell therapy. There has been great research done on this and it's gained a lot of traction over the last few years. However there is no trials done on people with hypermobility. 2 - Bone fusion. Surgeons mentioned that if my wrist does not get better then another option is to fuse the bones of the wrist together. Disadvantages - decreases movement in my wrist. stuck in one position. 3 - wait it out and see what happens. Increase supplements and keep trying different therapies. I did stop taking magnesium so I was wondering what magnesium is best for joints etc, as there is magnesium sulphate, citrate etc.? What companies have the best magnesium supplement? In addition I have started taking Hydrolyzed Collagen. it's in powdered form, made from bones of animals (my one is from beef) and doesn't taste great. However this has shown to have great health benefits with people who do have joint issues. Defo read up about it. You said nutrition was important and i agree. However i dont think it plays that big a part in my issue. I am particular about my diet. 85% organic diet. Grow my own produce. Free range eggs from neighbor. Clean meat from local butcher. We live in fraser valley of bc.. bread basket of bc. Almost no sugar. Limited organic wheat. Very limited dairy. High intake of ginger garlic greens..etc. Prob been sick 2x in past decade. Usually take 4000-6000 iu of Vit D a day. Try to increase anti-inflammatory foods and decrease inflammatory ones. Never eat junk food and consume red wine moderately. So... cant really improve much there... was taking fish oil to increase omega 3 but heard new conflicting studies about that and inflammation so stopped. Did notice any difference and at $65 a bottle figured it wasn't worth it. Q: is protein going to help repair damage if it is low acid inflammatory like fish as opposed to red meat. I rarely eat red meat or much meat but go to fish as much as possible. My doctor refuses to consider diet an issue... so i dont trust much he says.. but i dont know how to improve my diet any more than i am. My understanding is that low-inflammation foods...magnesium..omega 3... good protein are the keys to body repair.... what am i missing?? That's a pretty good diet! And supplementing with Vit D so that is probably pretty good (curious what your Vit D level is as 5k/day may or may not bring levels up, depending. Grass fed beef has the best omega 3-6-9 ratio by far. The trick with nutrition (or, the problem with thinking that one's diet [these days] covers all one's nutritional needs) and 'a good diet' is that your diet contains X amount of nutrition (higher or lower depending on your diet), but your nutritional needs/requirements can be higher than what you take in, and requirements can go up or down (but usually up). And then once you get low on nutrition, you not only stay low but get lower because as your requirements increase, long story short, you use up more and more. Thus I look to therapeutic supplementation when/as needed. Hopefully you're getting everything you need from your diet, but it's a safe bet that you aren't. Get out of pain etc, and then maybe nutritional requirements will match dietary intake. But in general, I go with that if you're hurting, you're short on nutrition (if only because pain and the existence of the factors that cause pain increase nutritional requirements). Grass fed red meat is good. If you're limiting your intake for health reasons, personally I wouldn't. Also in general, what you described looks pretty low in fat/good fats...I'd increase that for a variety of reasons. "Q: is protein going to help repair damage if it is low acid inflammatory like fish as opposed to red meat. " Yes. Do you have actual damage? "My doctor refuses to consider diet an issue..."
Arian and anonymous was both me, due to forgetting to add my name in the little box. But, just a word of THANKS Joshua. Still working on getting better. Haven't worked for over a year now, but noticed a huge difference after leaving construction. Still at about 50% after 5 years, but will do my best to focus on nutrition. Doctors here refuse to test for Vitamin deficiencies. It took 2 years of begging to get an MRI that showed TFCC...and other avenues are price problematic, but I sure appreciate the internet and sites with good information. You're welcome. Keep at it.